Kids of moms who have an autoimmune disease such as type 1 diabetes, rheumatoid arthritis and celiac disease have up to a three times greater risk for autism, according to a new study. Coincidentally, perhaps, there has been a four-fold increase in the incidence of celiac disease over the past 50 years. This finding reinforces the suggestion that autoimmune processes are connected somehow with the cause of autism and autism spectrum disorder. This finding is on the pathway of finding the cause of autism. There may be an overlap in the genetics of some of the autoimmune diseases and autism that would not be trivial. Autism is strongly inherited, but we don’t have the faintest idea where. 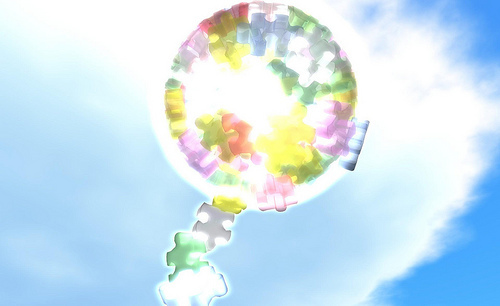 But this may point a flashlight to areas of the genome that connect to autism. He pointed out that these sensitivities might be factored in with environmental triggers. Indeed, recently we’ve brought you news on various environmental factors in ASD. Endocrine-disrupting chemicals in plastic may play a part. PVC has been linked to autism. And there has been a longstanding belief that thimerosol, a mercury-laden preservative in many vaccines, was a culprit. Mercury is a known neurotoxin. And we also must notice the UC Davis M.I.N.D. study that discounted better detection as the rise in cases of ASD. The researchers there said that chemicals we are exposed to are strongly suspected and should be studied further. Currently, genetics research is given much more funding than environmental research in the ASD field, approximately 10 to 20 times more. In this case, data was collected on 3,325 Danish children diagnosed with ASD. Data on family members with autoimmune diseases came from the Danish National Hospital Register. Eaton said that those diseases provided a link, but not a definitive cause. The increased risk for type 1 diabetes is a little less than two times, for rheumatoid arthritis it’s about 1.5 times and for celiac disease it’s more than three times. That’s enough to impress an epidemiologist, but not enough to make anybody in the general population start changing their behavior. Image: Torley on Flickr under a Creative Commons License. Autism Spectrum Disorder, like cancer, is thought to have many causes, both environmental and genetic. But unlike cancer, researchers don’t know yet what causes it. So they are looking for and finding many links on the pathway to a cure. I’m sorry if that is hard to grasp. And here I just read is was due to plastics! I remember when I was flying to Argentins in ’78 and they determined charbroiled burgers were cancer causing. Haven’t paid any attention to the latest drivel since then. After it is really decided – then time to consider change. It’s quite common for ASD kids to have GI issues, including Celiac, so this comes as no surprise to me, a Mama to a 4 year old with ASD tendencies and possible Celiac (no to mention a host of other GI concerns. It’s only been in the last few years that we discovered my family history of Celiac, we also have a host of other Autoimmune diseases like Diabetes and the rare Autoimmune TTP. I have no doubt that once ASD is figured out, we will find a plethora of causes. No two ASD children present exactly alike, so it wouldn’t make sense for everyone to have the same link. You make a really good point about the differences in children (and their genetics). Not only do they present different symptoms, but there’s a huge variance on the spectrum. The children with ASD that I know–many (not all!) have strict diets to avoid gluten and that helps the severity of their symptoms. But of course, that’s not the case for everyone. Celiac disorder is thought to affect 1 in 100 people, so many don’t even know they have this sensitivity. Celiac is one of those diseases that is very often misdiagnosed. I know a bunch of folks who finally got the correct diagnosis when they were well into their middle age. So I don’t think the incidence has *ACTUALLY* quadrupled over the past 50 years. It may very well have gone up, but better diagnosis likely accounts for a good portion of the apparent increase. After having misdiagnosed colon problems all of my life, my daughter, who is a med student, started learning about celiac disease. The things I’ve been learning from reading the material have been AMAZING! People with celiac disease have to live with gluten free diet for life. This does not sound as simple cause most of our daily product are made of gluten. Also there are many saying that children with autism will improve if they go for gluten free. Yeah it’s wonderful article for spreading the public to awareness disease in which the small intestine is hypersensitive to gluten, leading to difficulty in digesting food.